Contains Milk and Soy Ingredients. Processed in a facility that also processes Egg, Wheat, Fish, Tee Nut, And Shellfish ingredients. Isolate Protein Blend (Whey Protein Isolate, Hydrolyzed Whey Protein Isolate), Alkalized Cocoa Powder, Natural and Artificial Flavor, Soy Lecithin, Salt, Xanthan Gum, Silicon Dioxide, Sucralose, Acesulfame-Potassium. Do not use if pregnant or nursing. Consult a medical doctor before starting a diet or exercise program. NOTICE: USE THIS PRODUCT AS A FOOD SUPPLEMENT ONLY. Isolate Protein Blend (Whey Protein Isolate, Hydrolyzed Whey Protein Isolate), Natural and Artificial Flavor, Soy Lecithin, Xanthan Gum, Silicon Dioxide, Salt, Citric Acid, Red Beet Powder (Color), Sucralose, Acesulfame-Potassium. Isolate Protein Blend (Whey Protein Isolate, Hydrolyzed Whey Protein Isolate), Natural and Artificial Flavor, Soy Lecithin, Xanthan Gum, Silicon Dioxide, Salt, Sucralose, Acesulfame-Potassium. Mix 1 scoop with 6oz. of cold water or skim milk in a glass or shaker cup. Use between major meals and before and after exercise. Read the entire label before use and follow directions provided. Isolate Protein Blend (Whey Protein Isolate, Hydrolyzed Whey Protein Isolate), Natural and Artificial Flavors, Soy Lecithin, Xanthan Gum, Silicon Dioxide, Salt, Citric Acid, Red Beet Powder (Color), Sucralose, Acesulfame-Potassium. 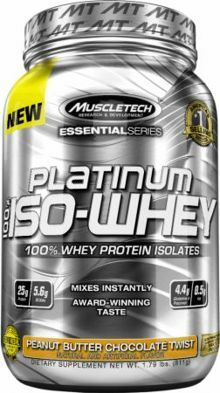 Isolate Protein Blend (Whey Protein Isolate, Hydrolyzed Whey Protein Isolate), Natural and Artificial Flavors, Soy Lecithin, Xanthan Gum, Silicon Dioxide, Salt, Sucralose, Acesulfame-Potassium. Gourmet Milk Chocolate This is a Buy 1 Get 1 FREE offer!